Can you believe I finally have a project for you today? I recently changed the colors in our bathroom. I bought a new shower curtain, hooks, towels, rugs, but that left me with a problem……the walls. I needed something for over the towel bar. This idea first hit me when Becca did it. 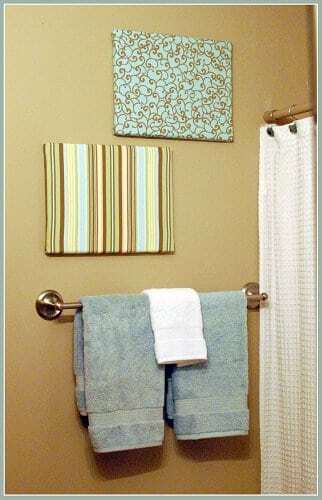 I did mine a little different, since I was only needing small wall art, I simply bought a two pack of Artist Canvas at Hobby Lobby for $4. But if you want a large piece, I would recommend the way Becca made hers. I love how they turned out! 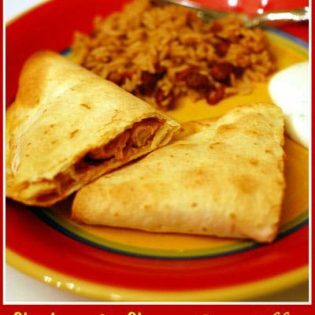 They were super easy…..and cheap! 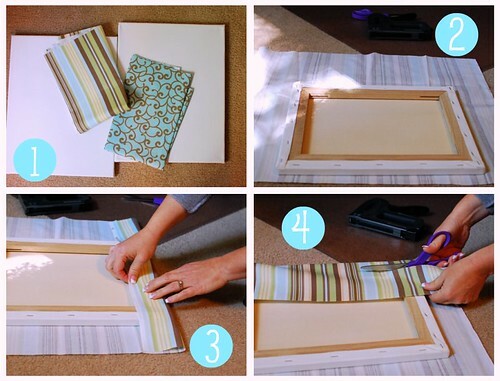 With any size canvas and your choice of fabric, lay the right side of the canvas on the wrong side of the fabric. 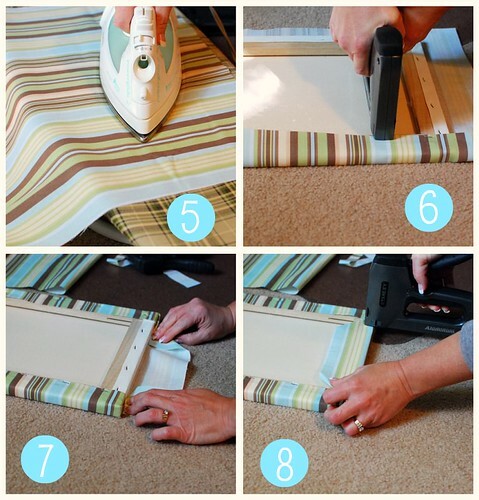 Measure your fabric and cut to size. You will want to be sure to iron your fabric, or you will see creases in your finished piece. Pull fabric tight and staple several times along two opposite edges. On the ends fold the corners as you would a present, pull up tight and staple. This is an inexpensive way to decorate a wall, and when I get tired of this fabric, I’ll rip it off and start over. The possibilities are endless, and there are so many amazing fabrics available! This was fun, easy and quick…..I can’t wait to make a large one for another room! Wouldn’t something like this be amazing?! What a great idea! Those fabrics are lovely, and I love the way you chose two that coordinate. And you're right: the possibilities are endless! Great job! Enjoy your handiwork! 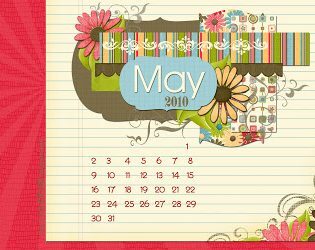 I love canvas' whether it's covering them with fabric, painting on them or putting photos on them, they are a quick and easy project! I posted Sat. about a photo canvas I just did 🙂 I should upload the painted ones I've done. Really fun stuff! Love you fabric. Ok this is BRILLIANT! I mean, I've heard of it before but this reminded me how easy it would be for ME to do it! We just moved and this is the PERFECT idea for my girl's rooms. Great i've always wanted to do this but never got round to it. Very cool idea and like you said… the possibilities ARE endless and easy to change ? So smart! I have a few blank spaces in my walls and have been looking for the "perfect thing" to put there. This would be great! I guess I'll make that clearer next month, as I've had a few non related links..
A-HA! Here's more of the bathroom…. I'm still searching for more… you know, just in case. A nice stuff to do,I become interested to try also and create my own design to be display on my living area.Thanks for the share very useful. A nice stuff to do,I really like the idea of creating things that become useful to add beauty in your house.Thanks for the share very mush appreciated. Its pretty neat and stylish. I think its fun to create one myself. A very girly stuff which I will be enjoying making it. Thank you so much for this! I just made five of these in two hours for my new apartment and they are perfect! I was thinking of making something like this but with using styrofoam and pins and putting several together to form a collage and using 3m command strips to attached to wall. I love the concept. I am in process of doing this same thing but I have a question. I am using Canval Panels instead of Canvas. Can I use the staple gun or is it best to use something else to attach the fabric to the panels since they are thinner?